When you are outside, how do you play your favorite DVD movies? Take a DVD player? It is not accepted by most of you. How about playing DVD movies on your iPod? It sounds a good idea? But how to make it? Definitely, convert VOB to MP4/MOV/M4V files so that you could play it conveniently on your iPod. Why convert VOB to MP4/MOV/M4V? When it comes to DVD, you will think of a disk with the videos. DVD, shorted by digital video disc, is created by homemade hobbyist or commercial producer. Commonly, DVD is compressed in MPEG2, and the video format is VOB, so if you insert a DVD into your Mac built-in drive, then you could open the VOB video file and play it directly. For iPod touch, iPod Nano, iPod Classic and iPod Video, it only accepts the limited video formats, MP4, MOV and M4V. If you want to play DVD videos on your iPod, you need to get a VOB file converter to convert VOB to MP4, MOV and M4V. Then copy the converted video into your iPod for watching freely. 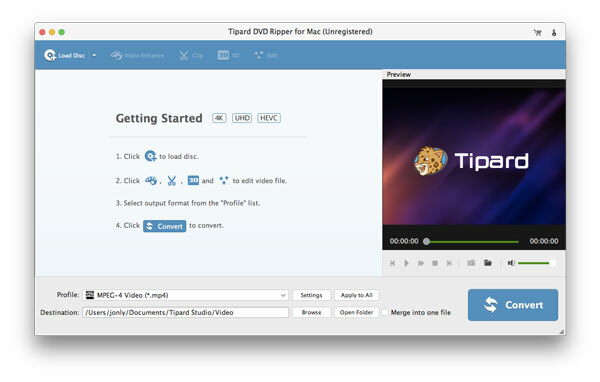 For converting VOB to MP4, you are required a VOB file converter, Tipard DVD Ripper for Mac is the exact one tool that can help you. Firstly, free download this program to your computer. Kindly note that, this VOB file player has its Windows and Mac version. You should download the correct version to convert VOB to MP4, or MOV on Mac or Windows 10/8/7/Vista/XP. Here we take Mac for example. 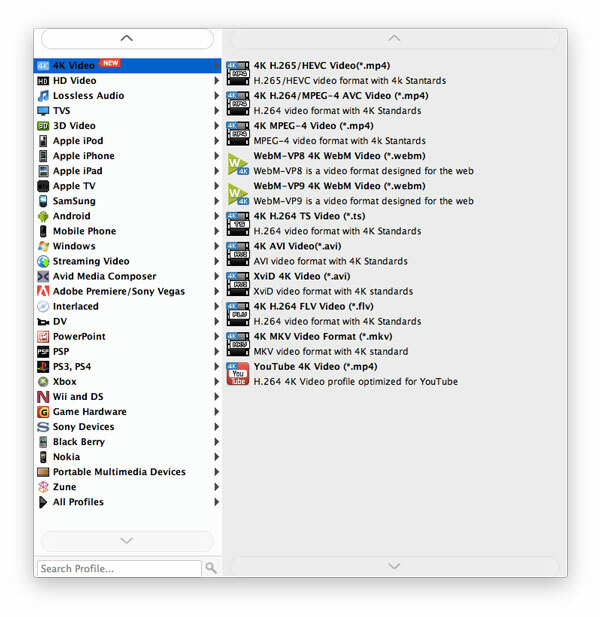 After downloading DVD Ripper to your Mac, install and launch this program on your Mac. Insert your DVD into your Mac from its side, click "Load DVD Disk" to import your DVD file. Then you will hear a sound from your Mac, that is what your Mac is loading the DVD files. Wait seconds for this program to load those files. You could open VOB format files and play it with the preview window on the right side. Choose your wanted MP4/MOV/M4V format from the drop-down list of "Profile" to convert VOB files. Here you could print "MP4", "MOV" or "M4V" in the search bar, also you are allowed to select "Apple iPod" to find the wanted video formats for your iPod touch, iPod Nano, iPod Classic and iPod Video. After you choosing the output format, click the "Convert" button to convert VOB to MP4/MOV/M4V on your Mac. 1. Not only convert VOB to MP4, MOV and M4V, it also enables you to convert VOB to WMV, AVI, MKV, MPEG, etc. video files to play on your other devices or editing software. 2. Watch DVD video on iPod is not enough? Go to listen to MP3 music on iPod. This converter is powerful enough to copy audio from DVD video files to MP3, AAC, AIFF, etc. audio file for listening on your iPod casually. 3. Before you convert VOB files, you could edit VOB files to create special effects. Rotate sideways video to correct angle, convert 2D to 3D for an experience with your VR tool, clip, crop, even watermark video to customize your own video. 4. Compared to online VOB Converter, this program is safe enough to protect your privacy without any plugs-in. you could load and convert VOB video files without any internet connection. 5. After converting DVD to iPod compatible formats, you could sync video to your iPod with some certain iPod transfer tools. 6. Enhance VOB video files quality before converting to other formats. You are allowed to improve video quality in four ways, raise video resolution from lower to higher, adjust brightness and contrast automatically, remove video noise and reduce video shaking. You could enhance your DVD movies easily with one click with this feature. 7. If you load HD DVD movies, then you could choose HD MP4 to convert to HD video for your clear vision on your iPod. 8. If you want to put your DVD movie parts into one file, then you could choose all VOB video parts, then click "Merge" button (the first button under loaded movies list) to make the VOB video parts into one complete video file. 9. As a VOB converter, it also lets you preview the video effects by playing the VOB files as a free VOB player. Before you converting it, so that you could make adjustments duly.